The process of improving the ranking of a website on web search engines. On-Page SEO is a mechanism of optimizing individual web pages in such a way that they rank high in Search Engine Ranking. Why are higher search engine ranks important? Higher search engine ranks earn more relevant traffic to the website, and you get more business viability. How is On-Page SEO done? Here, we are sharing 9 incredible On-Page SEO Optimization factors that can change the fate of your website. Remember, there has been a lot of evolution in On-Page SEO practices so far. Hence, you have to be updated about what is relevant and what is not! New technology means new buzzwords! Being a successful SEO specialist, you need to be informed about what is happening around you in the SEO domain. You can manually name your html and other web files. Or, if you use platforms such as WordPress, it automatically creates SEO-friendly permalinks. And, you also have the liberty of changing the default structure. Keep the permalink simple and short. Keep it relevant and meaningful. SEO-friendly Permalinks bring great benefits to the SEO and helps you in achieving your SEO targets. 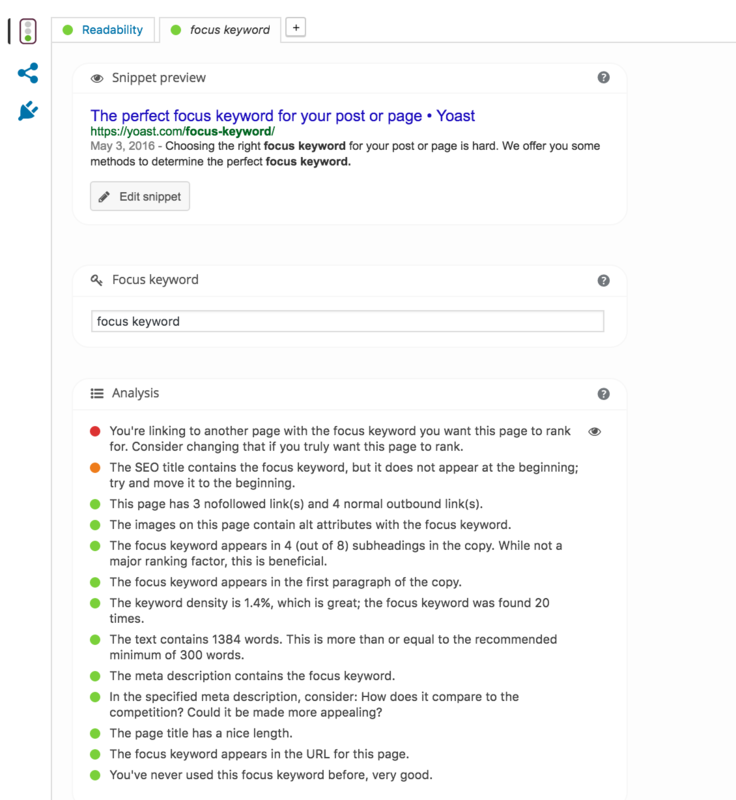 Use a plugin like Yoast to improve SEO in WordPress. When the title tag includes keywords that users are looking for, the search engine will highlight the keywords in the title tag in search results. Yes, it is an effective trick to improve the click-through rate of your website. Only those keywords or phrases should be included that are relevant to the content and important for the specific page. You can get it by conducting a thorough keyword research. Put the main keyword at the beginning of the title tag. Put the secondary keyword at the end. Separate important phrases and keywords using pile separator. Do not include any punctuation such as underscore, comma, dash, etc. (barring keywords that are normally written with that respective punctuation). The effectiveness of On-page SEO strategy depends on several parameters and keyword is the most critical. Optimum use of keywords in the title tag elevates your SEO ranking. Multimedia creates a bond between the user and content. Use videos, images, and audio files and create an overwhelming effect. Engage your audience by making optimal use of multimedia. Research proves that viewer engagement increases manifold when there are slideshows, video clips, and interactive audio. On the other hand, looking at seemingly endless text matter erodes interest. It is very likely that viewers will click the “Close” button! By including interesting multimedia files, you ensure that viewers stay longer on the site and the attention span increases significantly. In the era of fast internet, we have a very little attention span. Hence, anything that forces the users to remain hooked to the content is always welcome. Also, search engine crawlers take notice of multimedia files, and it results in an increase in website ranking. Latest SEO analyses in 2017, show the use of multimedia is a winning strategy. With the easy availability of high-speed Internet, multimedia no longer remains an inhibiting factor for the loading time of your website. Outbound links are links that point to other domains from your website. Search engines understand about your niche by following outgoing links. More than that, these links play a vital role in establishing quality and trust of your website which is a pivotal aspect of SEO strategy. Studies establish the fact that there is a positive correlation between search ranking and outgoing links. Of course, external links need to be supplemented with excellent content on the website. Outbound links increase your popularity and heighten relevance. They boost the value of your website and enhance reputation. Moreover, outbound links encourage back linking as well. This is the reason; SEO experts emphasize a lot on creating meaningful and relevant outbound linking. While the content of the website should be relevant to the keyword(s) you are targeting, it’s also important to get to the point straightaway. Do you think that every placement of a keyword is equal? The fact is certain places are more important in the content than others, as far as On-page SEO is concerned. Hence, you need to be skeptical about not only the selection of keywords but their placement as well. Titles, descriptions, images and multimedia, URL, headings and the first 100 words are important locations to place relevant keywords. Since search engines give more importance to the first 100 words of the content, it will be a good strategy to place keywords there. Using a keyword density analyzer tool is a good tactic to visualize the keyword distribution would be a good idea. Well, headings always make the content readable because they act as visual cues and convey the crux of the content almost instantly. Many readers use it as the deciding factor whether to read the content or not. Sometimes, readers just skim the content. They will read it more attentively if the heading or sub-heading evokes enough interest. Not only readers or viewers but search engines also pay attention to the headline. Nicely written headings with proper wrapping of title enhance search engine optimization. The page Headline is different from the <title> tag of HTML. The <title> tag doesn’t appear on the webpage. Similar to the headline in a printed format, headings on web pages, increase your attention span. Google also takes into consideration the time spent on a webpage for determining the SEO ranking, hence it is not wise to overlook it. Breaking up content with shorter paragraphs and subheadings is also a good idea. It has been a frequently asked question in the SEO world. Does long content affect SEO ranking positively or is it just a ruthless waste of time and money? Our experience has revealed that there is an amazing co-relation between the content length and SEO effectiveness. There are several explanations for it. Some feel that longer content earns more links and hence, there is an enhancement in SEO ranking. Others feel that since long content has better On-page SEO optimized, it brings obvious benefit. Long content certainly appears to rank higher, even while addressing all other SEO aspects. Search Engines generally tend to trust longer, relevant and original content more than short snippets. It also has a positive impact on secondary effects of optimization, e.g. longer time spent on the website by users. Google Analytics throws light on this important aspect. There are so many visitors who come to your website (either on the home page or internal page) and leave soon after. The phenomenon is called Bounce Rate, and it is pretty high in some cases (in the range of 80 to 90 percent). It boils down to imply that your website is not able to retain visitors. Put something there that captures attention or makes a visitor move on to a second page. A high bounce rate means visitors do not find what they want from the website, or they do not find anything else interesting there. It is needless to say that there is hardly any probability that the visitor will ever land up to the page again. How to drive a breakthrough in alluring the visitor so that he will come back again is also a critical factor. The less the bounce rate, more effective is the website. It is no longer a secret that well-researched LSI keywords can improve On-page SEO ranking considerably. Yes, it makes sense because people search for the same keyword in different ways. If your page includes all other relevant and related indexing by using Latent Semantic Indexing (LSI), obviously it is more visible than others. LSI is a system that works on the user pattern search and behavior. It talks about how one keyword search is linked to another. LSI has multiple benefits. You improve the On-page SEO ranking, you reduce the bounce rate, and you make your site more authoritative. Your content appears differently in the crowd of content and you bring more subscribers to the website. It means nothing else but more business! Did you like this article? Don’t forget to write your comments below and share! This entry was posted in SEO and tagged ON-page SEO on July 8, 2017 by Puneet Badam. Have you ever observed that better CTR i.e. greater traffic to your website leads to better organic search results? In case you have run PPC Ads, you may have noticed this. You may have written a nice article and published it on your blog. Now you need to find out where does it stand in the search results. As an example let’s consider you searched for “content marketing services in Pune”. And, you found the relevant blog is lagging behind on the 2nd page of search results. Now tweet the link to your followers/ post on FB & Linkedin and search again the next day. And you will be surprised to see it in the top 3 results for content marketing services in Pune. It’s likely many of your followers clicked the link and the increased CTR resulted in improved rankings! Have you searched for your own site’s keyword and clicked on it? If you do this regularly, you may find the organic ranking improves as well. You can also ask your friends to search and click. Of course, this will be regarded as black hat so don’t rely on it forever. Try it just for this experiment. As mentioned earlier, the PPC ads you run increase the CTR and end up also have an impact on the SEO as well. Why does CTR impact your SEO? Understandably, when a user searches for a keyword and clicks your URL, Google determines that the particular webpage is relevant to that search. When more such searches and clicks happen, your site is sure to be promoted in rankings by Google. How can you take advantage of this to increase search rankings? The Meta Title and Meta Description are immediately noticeable in search results so make sure they are most optimized. Keep your description 140-155 characters. Use a title that will attract the reader’s attention. Do you want to more tips on how you can safely increase your CTR and your rankings? Reach out to Spree Marketing today! This entry was posted in SEO and tagged click through rate, CTR on May 31, 2017 by Puneet Badam. Almost every business organization has a website. New companies first think seriously about a website & SEO even before the inception of the company. WordPress is a highly popular platform to build websites and here we are discussing how to improve SEO for WordPress Websites using Yoast. Companies reserve a budget for creating and maintaining a website. This is because the necessity of a website has been realized and accepted even by the most adamant and conventional business people. One just has to change as per times and having a website for an organization is one example. Even individuals, especially professionals have their own websites these days. The Google search result is important! Everyone has realised the factor Google plays in making or breaking a business. Higher rankings mean more leads, more credibility and more sales! It has become a common practice to write blogs on websites. These blogs promote the cause of the company in a number of ways; they are highly informative. They not only include information about the structure of the organization, the products, new additions etc. but also draw customers towards their websites by employing SEO strategies. SEO is an important aspect of web content. SEO or Search Engine Optimization techniques play a role in ranking a website at a higher position on search engines like Google, Bing or Yahoo. It will not be an exaggeration to say that there is a deadly virtual struggle among competitors to reach the highest position on the search engine list and businessmen do not hesitate to employ every possible means of increasing their SEO. What is Yoast & how does it help in SEO for WordPress Websites? WordPress being the most popular CMS platform, has a number of SEO-friendly plugins. Again, the most popular SEO plugin is Yoast. It can create wonders for your search engine rankings if you know how to make the best use of it. SEO for WordPress Websites using Yoast as a guideline is a must learn technique to ensure your WordPress website pages & blogs are optimized to maximum potential! Writing articles for newspapers, for magazines or for academic journals all have their own norms. The norms are decided according to the purpose of the article, the readers and their expectations and interests etc. Similarly web content writing has its own norms that decide the quality and standard of the articles or blogs. In order to make the content suitable for websites and social media, there are certain guidelines that must be followed. In addition, the kind of language, sentence structures, diction, style and all other aspects of writing have to be adapted to suit website norms. Hence, it is necessary for writers to acquire a set of new skills when they take up web content writing. The basic aim of web content is marketing. Hence, the language has to be persuasive, reinforced by strong phrases that create an immediate impact. The impact of content is of prime importance even more than the informative part. A blog that has an immediate and strong impact on the reader and that has the ability to top the list in a search engines is considered to be ideal. In this aspect, Yoast serves as a comprehensive solution to all onsite SEO needs. SEO for WordPress Websites by Yoast provides a checklist for refining blog content to suit modern SEO standards. In fact, Yoast gives two checklists related to the two key aspects of web content, viz. Keywords and Readability. Keywords are signal words. They are the words that an individual types into the search box of a search engine when he is in search of related information. Keywords drive the targeted web traffic to your website; hence they are a very important aspect of web content. In fact, keywords are the key aspects of content. Using the right number of keywords at the right places can serve the desired purpose at no extra costs. The success of a website and its ranking relies to a great extent upon appropriate use of keywords. The keyword must appear in the first paragraph of the article. The keyword is directly related to the topic of the blog. If a keyword appears after a couple of paragraphs, the attention of the readers will not be attracted towards it. The search engine bots also take this into consideration – The keyword appearing in the first paragraph is a signal that reflects the theme of the article. A keyword must ideally appear in the title and also in the first paragraph. The density of keywords must be appropriate. Density is the percentage of the number of times a keyword appears on the page and the total number of words on that page. Ideally the density must be 2 to 3%. You are likely to incur an over-optimization penalty if the density percentage is very high. Using keywords more number of times is not an indication of the best use of keywords. In fact, keywords must appear to be integral part of the content and appear at natural junctures. They must not appear like added patches. Ideal positions of keywords are specified. Key words must appear at the beginning of the article, end of the article, in the permalink, H1 tag, H2 tag and in the anchor text of relevant images. The Meta description must contain the focus keyword. Although meta data does not appear on the page, key words in meta descriptions must be used competitively. Key words can be used in sub-headings in the article. This is a factor from the SEO angle and is certainly beneficial. At least one sub-heading must contain the keyword. The images must be relevant to the focus keywords. – Use at least one image and ensure the alt tag of the image contains the main keyword. The article must contain minimum 300 words. Falling too short of this limit is not recommended. The focus key word MUST appear in the URL of the page. This is a very important factor that directs and channelizes engine search. This entire generation is not much inclined to read, read text books, newspapers, books, magazines or read any kind of content for that matter, including web content. In addition, if the content is presented in a difficult to read format, it reduces the chances of being read by a visitor. If valuable web content goes unread, its very purpose will be defeated. Search Engines like Google feel this way too. Hence, Yoast has provided a useful checklist to examine the readability of web content which improves the SEO of WordPress Websites. Sentences must essentially be short. Simple words must be used – So that they are easily understood by laymen. No one cares to refer to a dictionary even if it is there in the same device they are using, just for the sake of a word here and there. One cannot blame the generation; one should rather understand its characteristics and adjust the content. A paragraph should ideally contain approximately 150 words. A big paragraph with no breaks looks too texty and becomes unreadable. A paragraph must have unity. It means that each sentence in the paragraph must be related to the same topic. A paragraph must be cohesive and coherent. The sentences must follow each other smoothly, with linking words that link the sentences in the paragraph together in a logical and chronological manner. Around 30% linking or transition words are recommended within a paragraph. The active voice is preferred and the use of the passive voice is not preferred. More specifically, use the active voice instead of passive. Active voice directly addresses the readers and helps to connect with them on a personal level. It may not be possible to use the active voice throughout; about 10% sentences in the passive voice are acceptable. Avoid using the same words repeatedly. Also do not repeat sentence structures. Do not begin several sentences with the same word, phrase or grammatical element, particularly in consecutive sentences. Any kind of repetition creates a monotonous effect. There must be sufficient variety in diction, style, sentence structures and tone. The length of the sentences is also important. Sentences with 20 words are considered to be good. They should not contain too few or too many words. Long and meandering sentences with several transition words within are confusing. Readers lose track and fail to make sense. 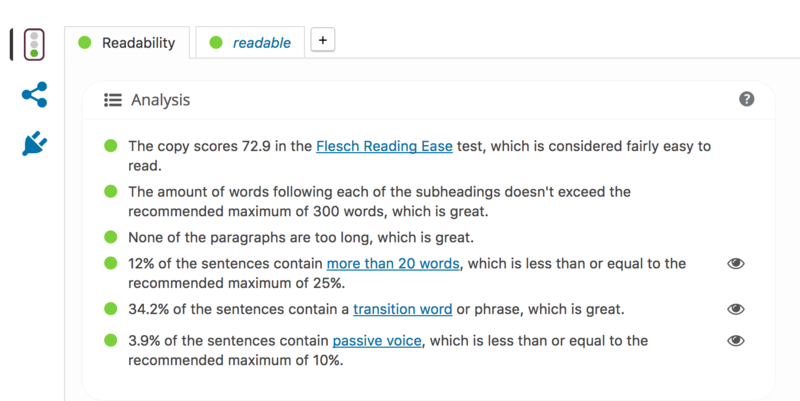 The Yoast plugin makes use of the Flesch test for readability in its plugin. Readability refers to the ease with which a reader can read and understand the meaning of the text. This test calculates the reading ease level of a text. The score in this test should be 7 to 8 if the text is extremely readable. This test calculates readability on the basis of sentence length and number of syllables. Readability Ease or RE should be higher, indicating the ease with which a text can be read. RE is based on ASL that is Average Sentence Length and ASW or the Average number of Words per Syllable. RE ranges from 0-100. One thing that most blog writers neglect is the structure of the entire text. just as the structure of a single sentence, a single paragraph is significant, the text is a combination of these sub-structures and must possess its own outlined structure. The body of the text contains a number of ideas the crucial part is the arrangement of the ideas or information. A haphazard combination of ideas will hamper the meaning. The ideas or information must be systematically organized. Similar topics should be brought together. One topic or theme must lead to the next. Reserve one paragraph for each new idea. Leave some white space to separate paragraphs. Do not leave white space randomly. The visual aspect complements words and sentences. Ordering can be logical, (cause-effect), chronological (old-new), didactic (easy-hard) or thematic (based on themes). A writer who has good command over English language can develop the skill and art of blog and web content writing. It is necessary to understand the mode, the technology, the spirit of the new age that revolves around mobile devices and is engaged in online transactions for a major part of the waking hours. So writers must wake up, shake themselves and be prepared to adapt to new styles and new norms. If you’ve liked this blog on SEO for WordPress Websites, share it on your social media. Following these tips will surely assist in improving your SEO. Any questions? Enter in the message box below! This entry was posted in Home, SEO and tagged SEO for Wordpress Websites on April 22, 2017 by Puneet Badam.